All tires should be mounted only by trained personnel. Consult the tire manufacturer's publication(s) for information on tire care, safety, maintenance, mounting, manufacturer's warranty and other information found in the manufacturer's brochure(s) and on manufacturer's website(s). Failure to follow manufacturer's recommendations and requirements can cause tire failure resulting in serious injury or death. Make sure to select a tire that meets the load and speed requirements for the application it is intended for. 1 Nominal section width, expressed in metric, inch or alpha. 2 Ratio between tire section height and nominal section width. This ratio is not indicated when section width is expressed in inches (eg. 3.50-18). 3 Code for tire construction (- = Bias, R = Radial, B = Bias Belted). 4 Nominal rim diameter size in inches. 5 "Motorcycle" in abbreviated form. Differentiates motorcycle tires and rims from those designed for other vehicles. Not shown on all models. 6 Expresses the tire's maximum load capacity (pounds) at the pressure indicated (psi). See load index chart below. 7 Speed symbol. Indicates the tire's speed. See speed rating chart below. 8 Tubeless (TL) or tubetype (TT), as applicable. 9 The arrows indicated the direction of rotation of the tire according to the fitting position (front-rear); applicable for directional tires only. 10 Number of plies and material. 11 Abbreviation of "US Department of Transportation." 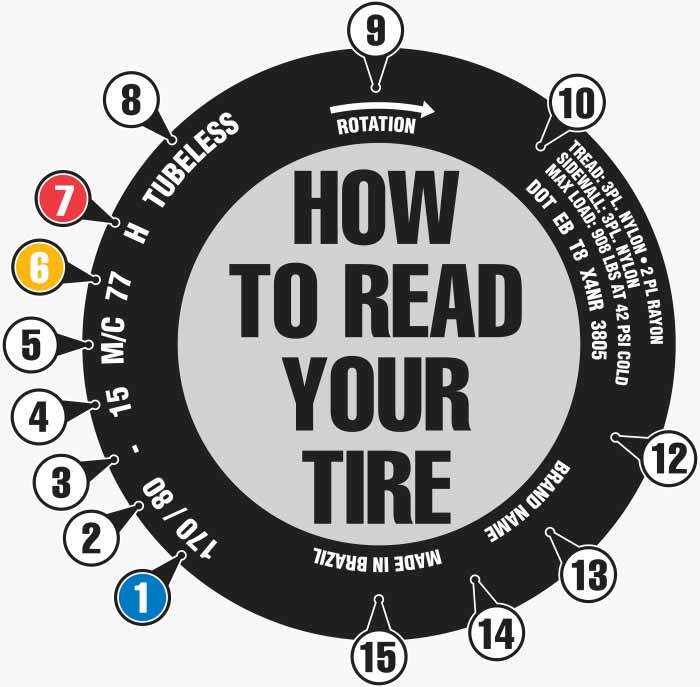 Serves to indicate that the tire conforms to the regulations issued by the US Department of Transportation. Includes the serial # for the tire, and the last 3 or 4 numbers represent the date. Example 3805 means the tire was produced in the 38th week of 2005. 13 Brand name and registered trademark. 14 Type of tread pattern and/or product line. 15 Indicates where the tire was produced. Size may be indicated in inches, metric, or by letters (alpha). The chart shows the approximate comparison of the different size indications.